Decisions! Decisions! We eliminate that with a chicken,beef and cheese enchilada. Traditional favorite of grilled chicken or steak, marinated in lemon juice and spices, sauteed with fresh white onions, bell peppers, and tomatoes. Served with flour or corn tortillas. Two soft tacos with crispy fish on corn tortillas topped with cabbage, white cream sauce and salsa de arbol. Memories of Rosarito Beach! Back to basics. One taco al carbon and a cheese enchilada. A South of the Border favorite. Our oven-roasted pork is served with guacamole and tortillas. Choice of 4 chicken or beef taquitos topped with guacamole, sour cream and tomato mix. Two grilled Mahi Mahi fish tacos in cilantro and lemon marinade, served on soft corn tortillas with lettuce, white sauce and fresh Sauce Fresca mix. Choice of chicken, steak or carnitas on soft corn tortillas. 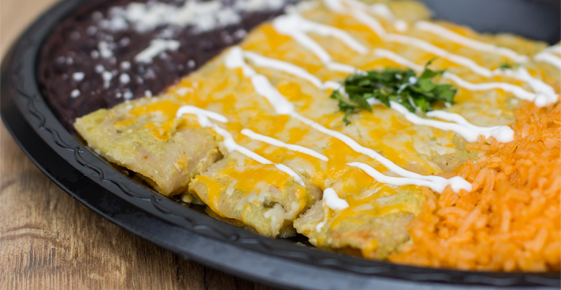 Two chicken or steak enchiladas with melted cheese and our signature spicy green enchilada sauce, topped with sour cream. One chicken tamale and one chicken taco. Two braised chicken & fajita vegetable enchiladas topped with our signature queso fundido. Pile of fresh - made corn chips, covered with black beans and melted cheese. Topped with tomato mix, jalapenos, guacamole and sour cream. Four crisp rolled corn tortillas filled with beef or chicken. Topped with guacamole, sour cream and tomato mix. Large flour tortilla filled with melted cheese. Served with guacamole, sour cream and tomato mix on a bed of lettuce. Large flour tortilla filled with black beans, rice, pico, lettuce, guacamole, and sour cream, individually sliced and topped with tomato mix and cotija cheese. Ranch dressing on the side. Charbroiled chicken, shredded beef, steak or pork on a flour tortilla, with melted cheese, guacamole and pico. Charbrolied chicken,shredded beef, steak or pork on a flour tortilla, with melted cheese, guacamole, black beans, rice, lettuce, sour cream and pico. Charbroiled chicken, shredded beef, steak or pork on a flour tortilla, with melted cheese, guacamole, black beans, rice, sour cream and pico. A blend of grilled shrimp, cabbage, rice, pico, guacamole, fish sauce & cheese. Chicken, steak or pork on a soft corn tortilla topped with lettuce and tomatoes. Grilled Mahi on a corn tortilla with cabbage, pico and Cotija cheese. Grilled shrimp on a flour tortilla with cabbage, tomato mix and Cotija cheese. Fresh cod rolled in batter then fried and topped with our special, creamy Sriracha sauce and cabbage mix. Charbroiled chicken on a bed of lettuce with fresh tomato, avocado, cheese and ranch dressing. Mix of greens tossed with chicken, cotija cheese and our very special cilantro caesar dressing. Served with sliced tomatoes and tortilla strips. Fresh lettuce with black beans, corn, pico, avocado slices, sprinkled with cotija cheese, tortilla strips and house dressing on the side. Served on a fresh Mexican roll with tomato, avocado, lettuce, onion and mayonnaise.